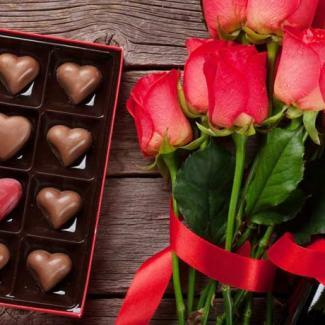 Don’t miss the Wine, Cider & Chocolate Tour, which will take place over two delicious weekends, Feb. 11th & 12th and 17th, 18th, & 19th from 11 a.m. – 5 p.m.
A scrumptious wine or cider perfectly paired with just the right chocolate can bring out the romantic in anyone. 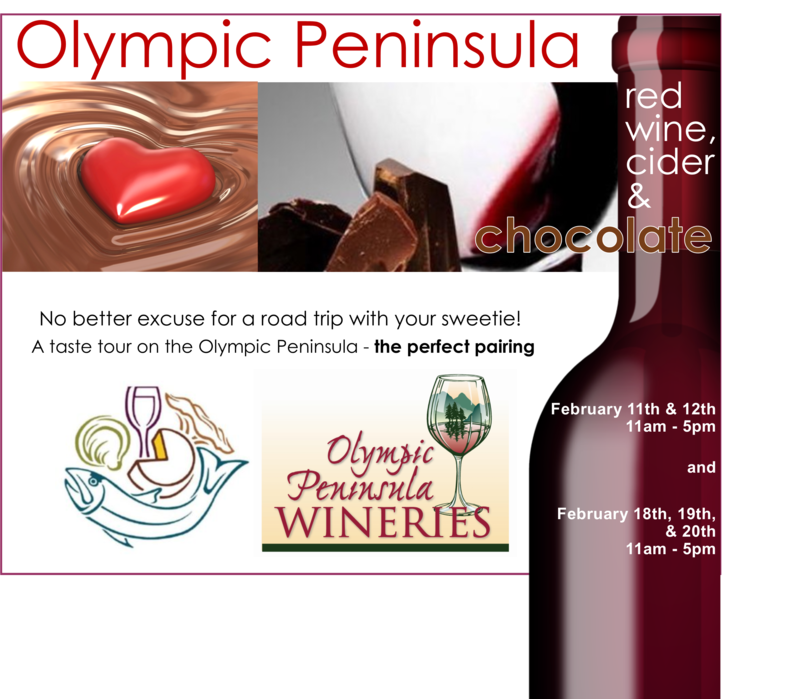 The Olympic Peninsula Wineries will take that perfect pairing to another level in 2017, bringing together new release varietals and blends created with premium Washington grapes and decadent chocolate delights that will make you a better wine & cider lover! Join us at The Fireside for “Dinner for Two” night every Wednesday in February. $48 per couple. Reservations recommended, 360.437.7412. February 14th Come join us for our early “Love” birds menu 3:30 pm -5:00 pm 2 for $48 or our special 3-course dinner menu starting at 6:00 pm. Dine to live gypsy jazz style music of Stringology $48 per person. Your choice of appetizers, entrees and desserts. Third Thursday we are offering Afternoon tea at 3pm, reservations required as we bake to order. Come and spend a gentle afternoon indulging, just a little. All food is gluten free, with dairy free menu on request. Gift certificates make a welcome Valentine gift, just call 360 797 1480 and we will send a gift certificate to your special Valentine. Take time away with your loved one to enjoy a romantic dinner with outstanding cuisine in the Roosevelt Dining Room, one of the top Olympic Peninsula restaurants. A special dinner menu will be offered on February 14th for dinner with the option to add Wine Parings. Kids menu will also be available. Make dinner reservations by calling 360.288.2900. Treat your sweetheart to something magical this year – a delicious three-course gourmet dinner for two, complete with an ocean view! Our Creekside Restaurant has one of the best views in the house, and our chef has put together a delectable menu that’s sure to impress. Seating is limited, and reservations are recommended so don’t delay! Make your Valentine’s Day Dinner reservations by calling 360-962-2271, ext 4007. Enjoy a fresh, local Valentine’s menu at Alderbrook every evening in February from 5-9 p.m. The resort will be offering a romantic five-course tasting menu, featuring decadent dishes like Wagyu beef, Weathervane scallops, lamb loin, and more – complete with optional wine pairings. On February 14, guests can also enjoy the music stylings of Tarik Bentlemasani while they taste the best of the Pacific Northwest at Alderbrook’s picturesque restaurant. The five-course menu is $80 with the wine pairings for an additional $35. Reservations can be made by calling 360-898-2200. Every Thursday from 7-10 p.m. in February, Alderbrook guests and locals alike can enjoy complimentary live jazz music with refreshing cocktails and small bites available for purchase. Performances include: David Deacon Joyner (Feb. 2), Red & Ruby (Lavon Hardison & Vince Brown; Feb. 9), Joe Baque & Steve Luceno Duet (Feb. 16), and Lizzy Boyer (Feb. 23). We are happy to introduce our new tasting room/winebar manger Anji Scalf. We also have a new kitchen manger as well. 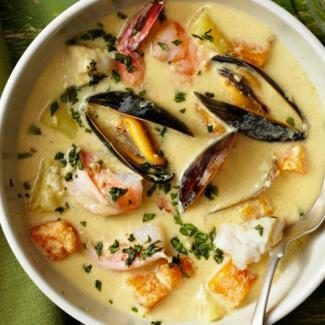 Spencer Clark has some fun new twists on pairing for and wine and food and beer. Please stop in and say hello and see what’s cooking. Winter Hours: Wed-Thur 2-6pm Fri 2-9pm Sat 12-9pm. Since we added breakfast to our daily offerings at Westport Winery Garden Resort we also had some great guest requests. For this reason we added delicious Swedish Pancakes wrapped around crisp bacon and topped with cranberry butter. Plus, we added Eggs Benedict to our menu served on our homemade cornmeal biscuits, topped with grilled maple-smoked ham, poached eggs, and our special lemony Hollandaise sauce. Breakfast is served daily from 8am to 11am. Lunch and dinner is offered daily from 11am to 7pm. The full menu is on our website. Treat Mom like a Queen aboard our private yacht, the Lady Alderbrook, with a caviar cruise and mimosas, brunch at our historic marina and a dessert return cruise. Treat mom (or grandma!) 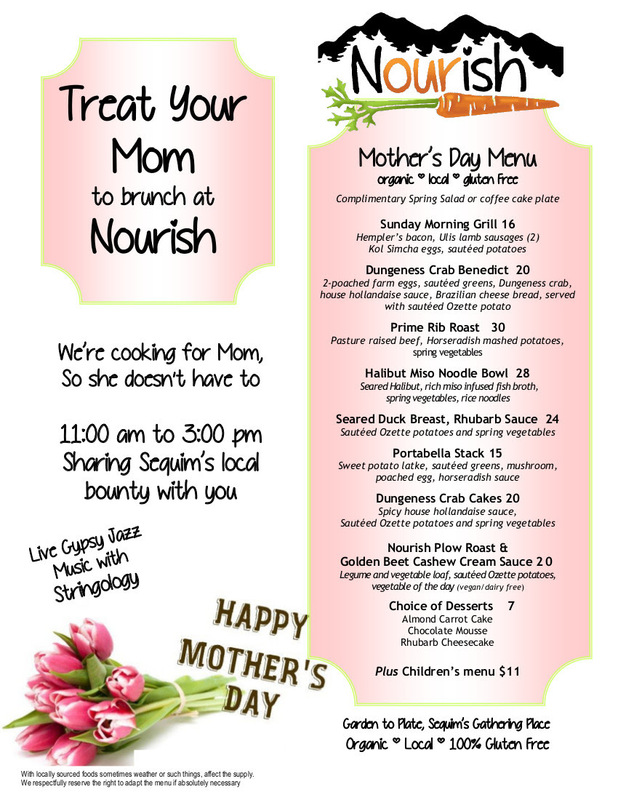 to a special Mother’s Day Brunch at The Fireside on Sunday, May 14th. Choose a made-to-order entree from our farm fresh selections. All entrees include a buffet loaded with fresh pastries, berries, fresh salads, a seafood station, and “save room for desserts, Mom” station. For reservations, please call The Fireside at 360.437.7412. 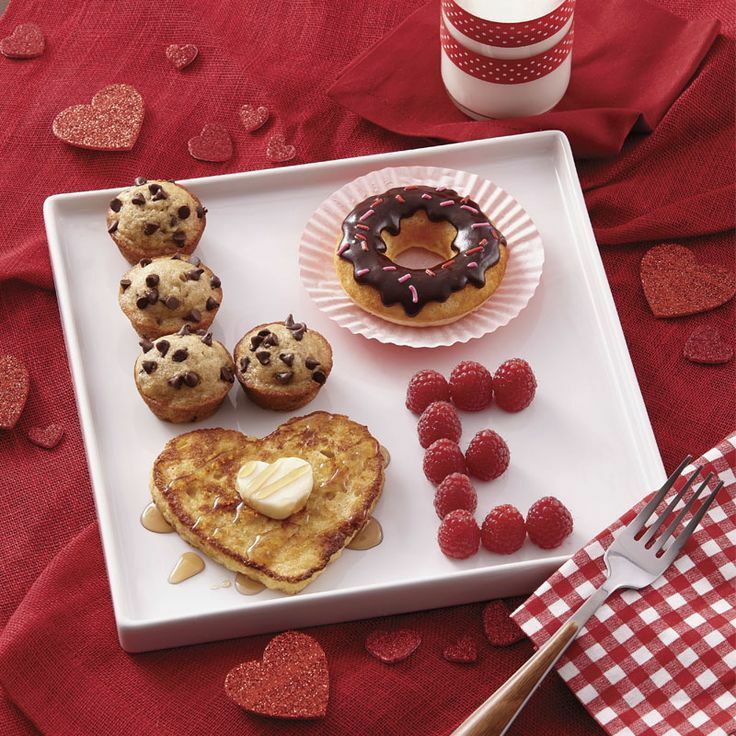 Honor the fabulous women in your life with our luxurious brunch. Children 5-12 $22.95 – Must be accompanied by an adult. Traditional buffet with carving station & bagel bar featuring house-smoked salmon & fresh Northwest seafood. Reservations strongly recommended. $34 per person; $18 kids under 12; kids 5 & under eat free.